Oh how I love Melbourne Cup Day. 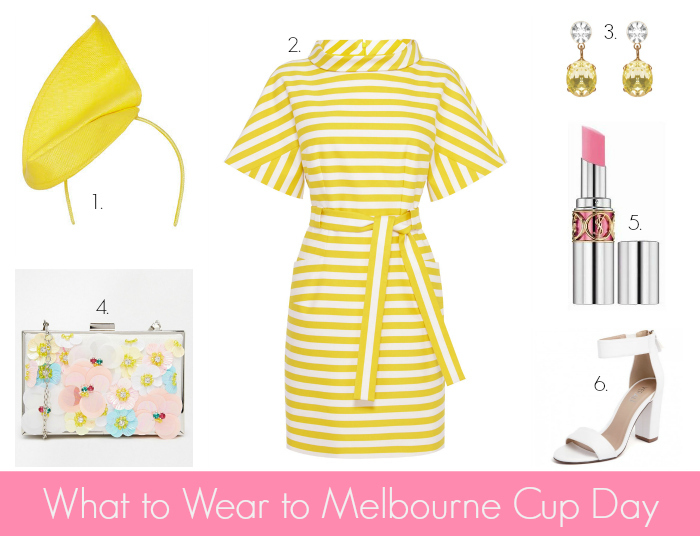 Aside from the race that stops a nation and the small matter of the public holiday factor, Melbourne Cup Day fashion is hard to beat for a colour lover like me. 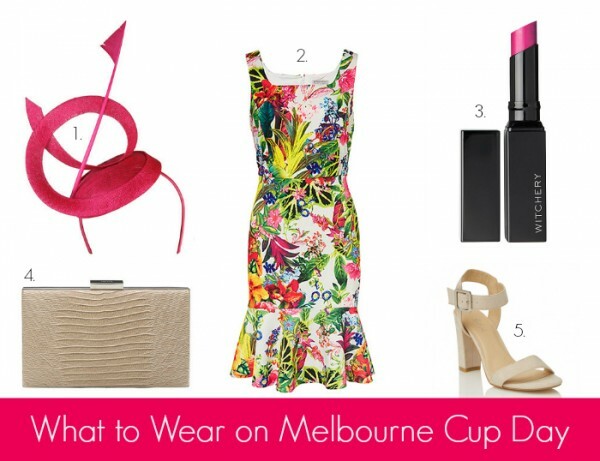 For Cup Day is a day that celebrates bold designs and colour, statement prints and striking head wear. Race goers become beacons of colour, like the thousands of roses planted across the race courses. Unsurprisingly, racing fashion is a heightened version of what’s trending in general fashion wise. So this year, expect to see plenty of citrus hues, cobalt blues and bright pinks. Style aside, it’s important to factor in comfort and practicality for race day (or any occasions really) as well. You’re looking for a frock that is long enough for you to sit down in and shoes that are comfortable enough to wear all day, including standing up for long periods and walking to and from public transport, in which case a wedge or block heel is likely to be a better option that sky high stilettos. Don’t forget your sunscreen, sunglasses, entry tickets, lipstick and Myki too. 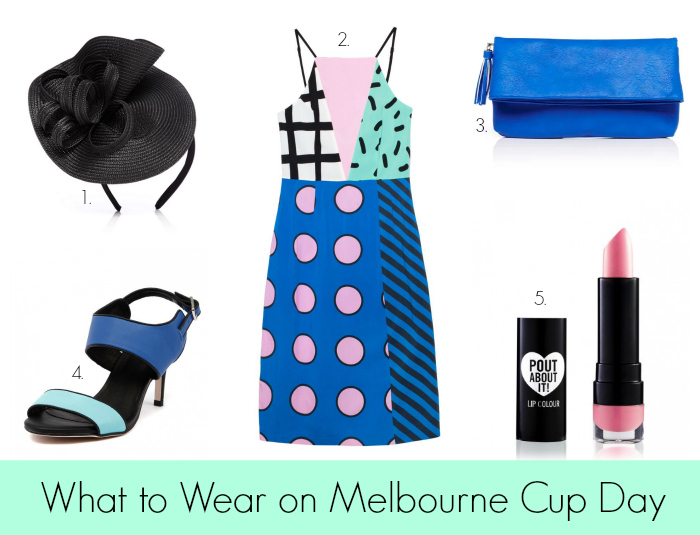 Below, I’ve put together three Cup Day worthy outfits that feature new season printed dresses as the hero. I reckon a printed dress is the easiest approach as it’s simply a matter of working back from the print as there is so much colour around in the accessories department. I haven’t spotted quite so many printed shoes or clutches this season though. But don’t be put off if you aren’t going to the races. Any of these frocks would be perfect for a Spring wedding, dressy do or a Christmas party as well. Just lose the fascinator and you have an outfit ready to go. So, over to out first frock – a gorgeous botanical print peplum frock from Target, a bargain at $59. 1. Morgan & Taylor fascinator, $79.95 from Myer; 2. Botanical Peplum dress, $59 from Target; 3. Orchid Lipstick, $16.95 from Witchery; 4. Olga Berg Evening Clutch, $89.95 from Myer; 5. Cara Strappy Sandal, $79.95 from Sportsgirl. For this outfit, I’ve let the print do the talking and kept most of the accessories a complementary neutral. The fuchsia in the print has been picked up with the fascinator and bright pop of lipstick. These Witchery lippies are lovely too – they are compact and perfect for carrying in small bags and clutches and have a nice, creamy consistency. Now on to our second outfit – this stunning apron style dress, one of the stand out pieces from the new collab between Melbourne artist Camille Walala and Gorman. 1. Structured Fascinator with Bow, $69.95 from Portmans; 2. Walala Splice Pencil dress, $249 from Gorman; 3. Jen Foldover Clutch, $39.95 from Portmans; 4. Canopy Heels by I Love Billy, $89.95 from Style Tread; 5. Pout About It Lipstick in Chatterbox, $9.95 from Sportsgirl. This dress is all sorts of awesome. It’s modern graphic print gives race goers plenty to work with in the accessories department. Here I’ve highlighted the cobalt blue and the mint green with the clutch and shoes. For a more classic look, all this dress needs is a great pair of black heels and a matching clutch. There are a great range of mid price fascinators at Portmans too and you’ll also find some of their dresses marked down in the lead up to November too. The final outfit features this absolutely stunning kimono sleeved frock from Karen Millen. I love yellow at the best of times and it’s so striking for the races. Then there’s the modern style and classic stripe which make this dress a winner on every front. 1. Morgan & Taylor Amelia Tear Fascinator, $139.00 from Myer; 2. Belted Stripe Dress, $375 from Karen Millen; 3. Cocktail Nights Stud Earrings, $49 from Alannah Hill; 4. 3D Floral Flower Box Bag, $41 from ASOS; 5. YSL Volupte Lipstick in Sheer Candy, $52 from Myer; 6. Carlo White Heels by Verali, $79.95 from Style Tread. I love everything about this frock – the cuffed neckline, longer sleeve, the self patterned belt. It sits a couple of inches above the model’s knee so it’s on the short side, but it would be perfect for a function on a milder day. I’ve paired it with simple but complementary accessories, and worked in a pretty print clash with the floral flower box. I’ve also opted for a more structured, architectural fascinator to complement the modern silhouette of this dress. For more information about dress codes, check out the Victorian Racing Club Member’s Enclosure Style Guide here. Have you any dressy do’s coming up? Which outfit could you see yourself in?